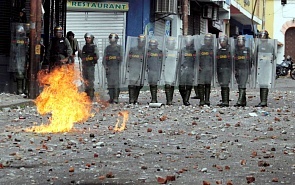 It is too early to talk about political power change in Venezuela. The leader of the parliament Juan Guaidó, the self-proclaimed “provisional president”, is a completely new figure in Venezuela’s political life. He has neither popularity nor political capital, he has not been visible in the public before. Nor does he enjoy any institutional support in the state. Therefore, it is impossible to talk about any legitimacy of his actions. In addition, we must not forget that the Parliament itself, on whose behalf Juan Guaidó was proclaimed, was removed from the legitimate field by the decision of the Supreme Court a year ago. Indeed, from the very beginning of 2015 the parliament, where the majority belongs to representatives of right-wing opposition parties, took the course for a “soft” change of power and the removal of Nicolas Maduro from the presidency. The failed attempt to convene a referendum on the recall of the president in January 2017 was followed by a unanimous vote on the recognition of Maduro as an incapable president. The current incident with Juan Guaidó is the peak of this long process of political destabilization. Not having mass support in the country, Guaidó and the opposition parties behind him decided to exploit the international factor. We cannot say with complete confidence what the preliminary agreements might be, but the almost synchronous recognition of him as a legitimate president points of the possibility of such an option. Moreover, the so-called “Lima Group”, formed on the basis of the Organization of American States in 2017, can be called the regional anti-Venezuela front without exaggeration. Guaidó mainly relied on the support of these thirteen states. In these conditions, a compromise between the government and the opposition is impossible. For two years, the authorities have tried to organize a peace negotiations process, but every time it broke down, also due to the fault of the opposition. On January 23, the Supreme Court authorized the prosecutor’s office to conduct investigations against parliamentarians who encroached on the usurpation of the presidential power. Therefore, in this context, the negotiation option is excluded. A US military intervention in Venezuela is extremely unlikely. Currently, the confrontation looks like a permanent “verbal war.” Venezuela’s government is under tremendous psychological pressure by constant threats. The military conflict option is only possible from the direct allies of the United States, primarily Colombia and Brazil, with whom Venezuela has common borders. The military bases in Colombia, where the US military feel quite in freedom, are a necessary and sufficient infrastructure for a hypothetical intervention. In June 2017, the United States conducted naval exercises with the participation of 17 Latin American allies in the Caribbean Sea near Venezuela. Such experience can be used in the present situation. If the United States does decide on a direct military intervention, this would lead to a civil war. The US would face colossal resistance. The Venezuelans actively adopted the experience of Cuba regarding possible fight against foreign intervention. It is enough to say that that two million Venezuelans are members of the so-called “militias”. These are paramilitary civilian formations, that also conduct regular military exercises and have extensive military experience. It is the militias that form the basis of the regular army. What the United States’ wants in Venezuela is quite transparent: its huge oil reserves. In the face of the collapse of the “shale oil project” in the United States, many oil refineries are vitally interested in cheap Venezuelan oil. In addition, the conflict between the United States and Venezuela should be viewed in the context of Washington’s growing confrontation with Beijing. Venezuela has set a goal to increase the volume of oil exports to China to one million barrels per day. In case these flows stop, China will suffer significant energy losses. If the pressure on Venezuela leads to a real change of power, it will be possible to speak of the final end of the “left turn” in Latin America. The “right turn” has already engulfed most of the states in the region, and Venezuela remains the last centripetal force of the left forces of Latin America. This is the Bolivarian Alliance, which unites ten states, six of them being small English-speaking island states of the Caribbean region. Venezuela’s exclusion from this chain can have a “domino effect”. However, this is unlikely to affect at least Cuba, which since 2011 has been carrying out careful adaptation reforms and is already preparing for the frontal offensive of the “right turn”. Since 2015, the Valdai Discussion Club has been studying global alternatives to the traditional neoliberal mainstream and their impact upon the world’s transformation. The main collision in the march of globalization is being shifted to domestic conflicts inside the West.